Even though the HiLux is considered one of the most durable, reliable and ruggedly-built vehicles in Australia, it still isn’t built for extreme off-road driving. While it may serve the average commuter and tradesman well, the off-road enthusiast will typically need some minor modification performed in order to avoid damage and getting the best experience possible. Being as popular as it is, finding a lift kit and accessories for HiLux is relatively easy. There are a couple of different types of lift kits you can install on your HiLux, and while some won’t, others will also need lift kit accessories for HiLux in the form of bullbar mounts, diff drop relocation kit, bash plate to diff drop, etc. Typically, suspension lift kits will need a few accessories and help from an experienced mechanic to have them installed, while the body lift and leveling lift kits won’t. Let’s talk about the 3 types of lift kits and what their purpose is, so that you can make an easy shopping decision. Some HiLux models have their rear side a few centimetres higher than their front end. This isn’t an ideal scenario for off-road driving, so you might want to even the level of height out by purchasing a level lift kit. The level lift kit is the most affordable out of all kits and doesn’t need much modification except lower strut mount extensions. A body lift kit can lift your HiLux’ body for 2-7cm from the chassis. This is probably the most common lift performed on off-road HiLux rides and it typically allows for the use of larger tyres, as the wheel well will be raised by the lift. You get the benefit of more clearance, but the largest benefit is without a doubt the ability to get larger tyres. Body lift kits typically include strap brackets, body spacers and rear and front bumper brackets as extra accessories. The main purpose of suspension kits is to give your HiLux more clearance. They do this by replacing the front and rear leaf springs and replacing them to lift the vehicle by 10-15 cm. 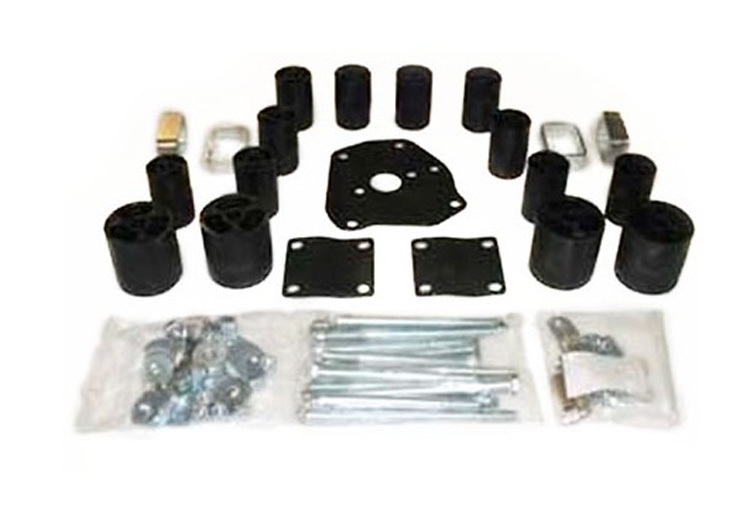 Oftentimes this can result in improved handling and the kits usually include accessories and parts like lower skit plate, upper strut spacers, lifted knuckles, sway-bar drop bracelets, CV spacers, crossmembers, CV spacers, etc. These lift kits are difficult and complicated to install, so it’s best you have a professional mechanic assist you.